The HelpSpot grid is a powerful view that can display rich sets of information about requests in your help desk on one screen. At times it can be helpful to create some visual separation between various requests in a particular grid view. 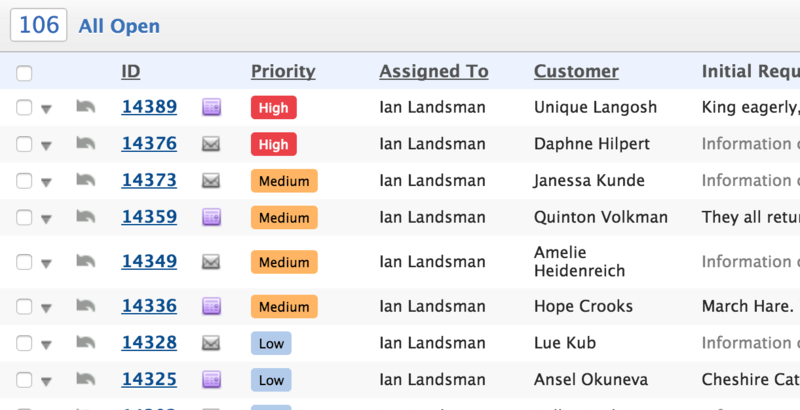 Filter color tags, a new feature in HelpSpot 4.5, provide an easy way to visually sort requests. Color tags are set on the Predefined List custom field type. To add color tags, navigate to Admin → Custom Fields. Then select an existing predefined list or add a new one. Once you have the predefined list setup open you can set the color options for each list item. The color can be selected by clicking on the color code box. Once the color options are selected in the custom field setup, we can add this custom field to a filter view. You can either add a new filter in the workspace or edit an existing one by clicking on the gear icon in each filter's menu. In the options tab of the filter editor, you can add the custom field using the column selector. After you save the filter you will see your colored labels displayed in your filter. Color labels can be used in multiple columns. Some common uses include priority columns, department selections or problem sub-types. We hope this addition in HelpSpot 4.5 makes your request handling experience just a little bit easier!